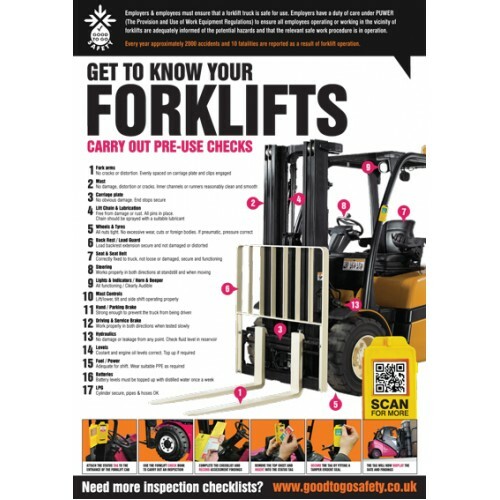 Our safety poster has been designed to reinforce the importance of completing daily inspections and is the ideal accessory to our Good to Go Safety inspection system. This poster provides a strong visual reminder to employees, showing what they should be looking for during a daily inspection and highlights checks included in the our inspection checklists. Produced on tough, durable, wipe-clean synthetic paper this poster is suitable for both internal and external use, making it ideal for displaying in even the harshest of environments. It rolls up for easy storage but won't tear or delaminate ? it can be easily positioned using pins, tape, adhesive or poster frames. A perfect addition to your equipment management system. Our safety poster has been designed to reinforce the importance of completing daily inspections and is the ideal accessory to our Good to Go Safety inspection system. This poster provides a strong vis.. Advise staff and visitors what to do in the event of a fire within the building, provides specific details relevant to the building in question. Material Options Explained Below is a more detailed de..